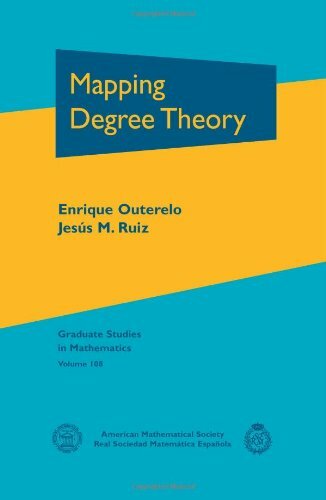 [PDF] Mapping Degree Theory (Graduate Studies in Mathematics) | Free eBooks Download - EBOOKEE! Description: This textbook treats the classical parts of mapping degree theory, with a detailed account of its history traced back to the first half of the 18th century. After a historical first chapter, the remaining four chapters develop the mathematics. An effort is made to use only elementary methods, resulting in a self-contained presentation. Even so, the book arrives at some truly outstanding theorems: the classification of homotopy classes for spheres and the Poincare-Hopf Index Theorem, as well as the proofs of the original formulations by Cauchy, Poincare, and others. Although the mapping degree theory you will discover in this book is a classical subject, the treatment is refreshing for its simple and direct style. The straightforward exposition is accented by the appearance of several uncommon topics: tubular neighborhoods without metrics, differences between class 1 and class 2 mappings, Jordan Separation with neither compactness nor cohomology, explicit constructions of homotopy classes of spheres, and the direct computation of the Hopf invariant of the first Hopf fibration. The book is suitable for a one-semester graduate course. There are 180 exercises and problems of different scope and difficulty. No comments for "[PDF] Mapping Degree Theory (Graduate Studies in Mathematics)".